Now I am a big fan of both Qnap and Synology Network Attached Storage (NAS) devices, but recently I have moved a number of people over that own Synology devices from a local USB disk backup to a cloud backup, be it OneDrive or Azure. For the small businesses these devices make a great all in one device but the Azure cloud backup has a number of limitations that Synology should address. If you own any of these devices you will understand the concept of “Shared Folders” which are top level folders that can be shared over the network for people or companies to consume over their local (or cloud / internet with the cloud station apps) network. 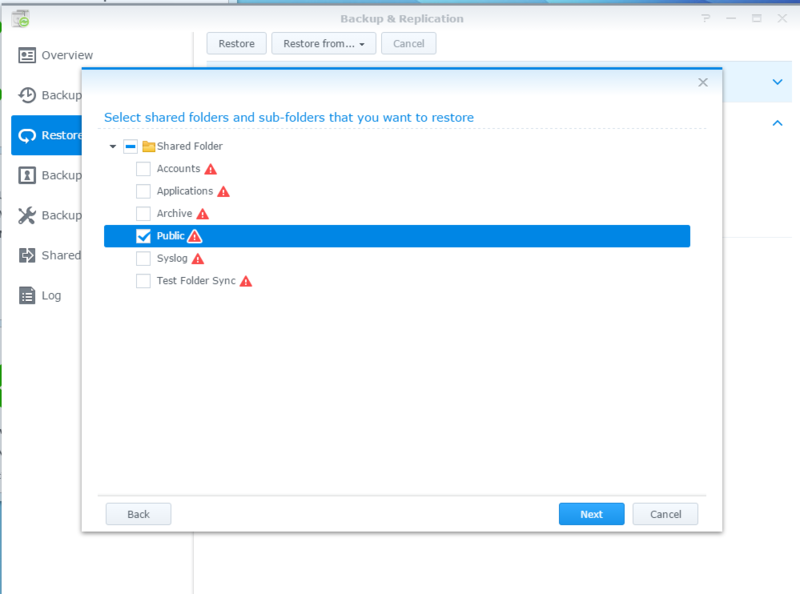 Generally speaking people would use create sub-folders and files under the shared folder and this is where Synology need to change the functionality, you can backup all the files and folders under a shared folder (including multiple shared folders) but you cannot restore files or sub-folders if you have backed up your data to your Azure Storage Account. When you go into the restore section it does not give you the option to browse any further down to select individual files or folders and on another point does not allow you to restore to an alternative location – I find this very frustrating for such a good piece of hardware – come on Synology. Having received confirmation from Synology support this is by design (ummm!) I am now left to revert back to the USB method. Synology please provide granular restore options for this service it would seem that your restore functions are lacking compared to Qnap. If you or anyone need assistance then please leave a comment and I will come back to you.